Things have been picking up here in the garden and at the farmers market. I’ve been trying to invent new ways to make use of all the bounty. A couple of weeks ago one of my favorite farmers was handing out samples of kohlrabi at the market and in all honesty I had never tried it before. Let me tell you – it was amazing! Subtly sweet, crisp and crunchy. I brought one home without another thought. Kohlrabi is a member of the cruciferous or cabbage family, often overshadowed by its nutritional show-stopper cousins broccoli, kale and cabbage. Kohlrabi has similar beneficial anti-inflammatory phytonutrients. Boasting more vitamin C than oranges, a smattering of B vitamins as well as potassium, copper and manganese, this humble “cabbage-turnip” packs a nutritional punch. What’s great about kohlrabi is the shape and texture lend well to being spiralized. Move over zucchini, there’s a new veggie noodle in town! It made the most amazing base for this simple salad below, not needing much more than a light lemon-cumin dressing to meld the crisp, slightly sweet flavors. Add some nuts and you have yourself a light meal are a substantial side dish. This noodle bowl could hold it’s own at any potluck or picnic outing and tastes even better the next day. I hope you’ll give kohlrabi another look the next time you see this odd not quite root/tuber/cabbage/turnip at the market. I know I certainly will. It’s already on my list to plant in the garden next year. Using a spiralizer, julienne peeler or mandolin, slice the kohlrabi into long noodle-like threads. Transfer to a large bowl. Thinly slice the cucumber and slice the bell pepper into thin, bit sized pieces. Transfer to bowl with kohlrabi. Chop the sugar snap peas into thirds and add them to the bowl as well. 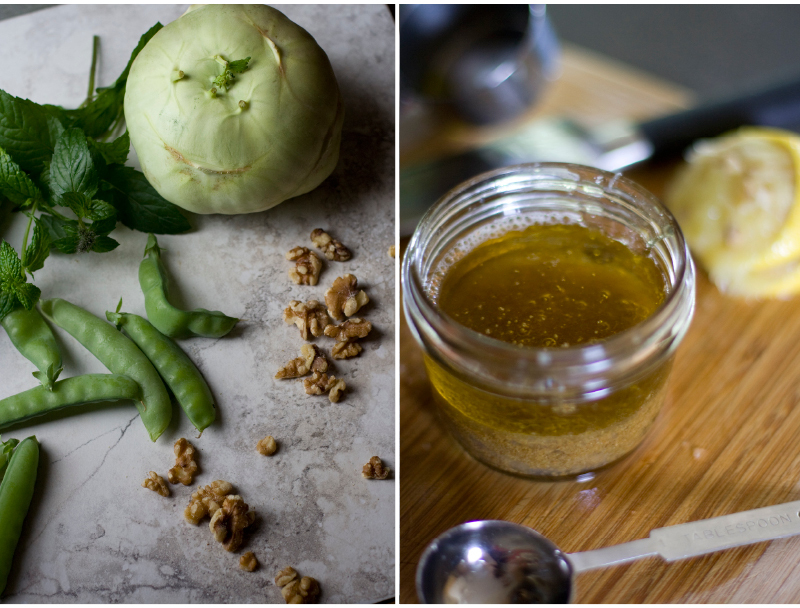 Combine all of the dressing ingredients to a jar, seal and shake vigorously (if your honey is very thick you could also use an immersion blender). Taste and add more salt or cayenne if necessary. Drizzle 2/3 of the dressing over the salad and toss to combine. Taste and add more dressing to taste. 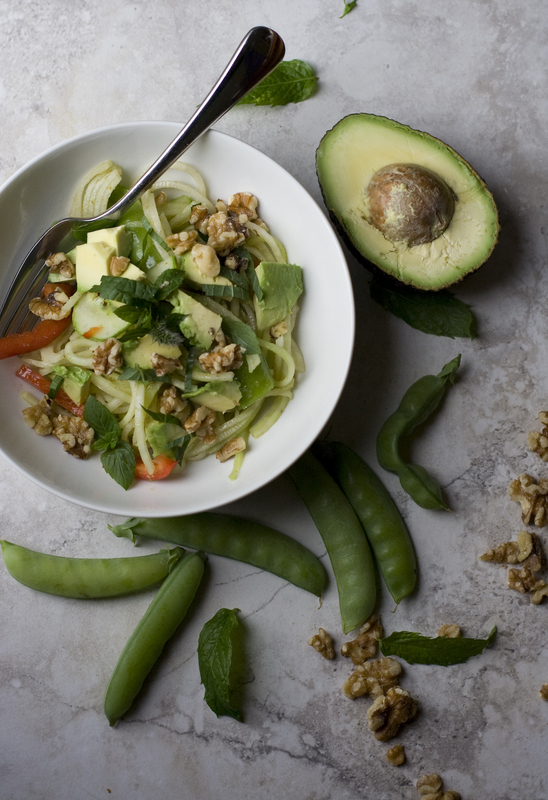 Serve garnished with plenty of avocado, walnuts and fresh mint. Thanks Maddie! A spiralizer is pretty awesome, but don’t let that deter you. I bet this would be just as good shredded and of course kohlrabi is pretty good on it’s own. Simply slice and enjoy! Great recipe! Very appetizing looking. Pretty and healthy, what more could you want? I’ve actually never heard of this vegetable! Is it best to hunt for this at farmers markets or could it also be found in stores? You can find it in stores from time to time, but your best bet is always the farmers market for the freshest, most nutritious veggies. It is easy to grow in Alaska, so many farmers grow them up here. And don’t toss the leaves if you are lucky enough to find still attached to the round part. The leaves are yummy shredded like cabbage, stir fried or steamed like spinach. Great tips Cheri – I’d like to try them mashed, sounds delicious!